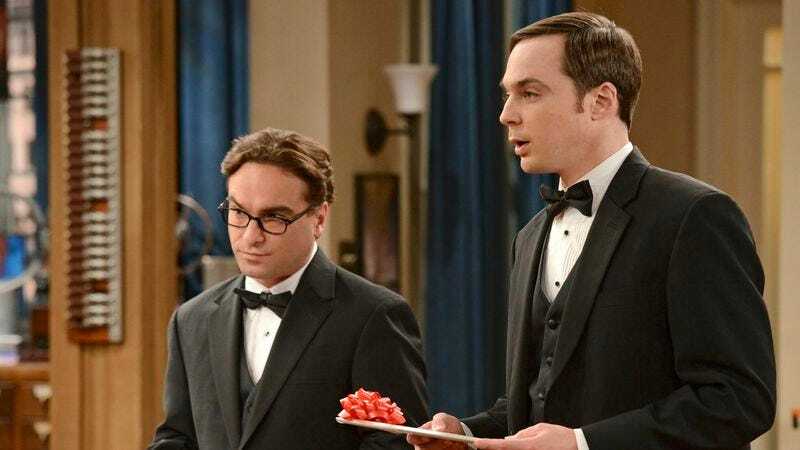 The fifth season of The Big Bang Theory ends on a quite literal high as Howard Wolowitz flies into space a married man, and “The Countdown Reflection” feels like a significant change for the series. There are no big season finale gimmicks, the Penny pregnancy I feared last week isn’t even on the radar, and instead, the writers turn out a completely satisfying final chapter to the season’s big plotlines. It’s not as funny as last week’s episode, but it delivers when it comes to that quality that has always been Big Bang Theory’s strongest suit: heart. This episode doesn’t end with a cliffhanger, but instead, it ends on the promise of a sixth season focused on three couples and a maybe-gay Indian guy. This season took some time reaching that status quo, but Bernadette and Howard’s wedding is the moment when everything changes for this group, and not just because now they’re all ordained ministers. The episode begins with Howard in the space shuttle with his fellow astronauts, who call him “Froot Loops” because he lives with his mom and has a gay haircut. It’s like being back in high school again, except now Howard’s a married man. The episode flashes back to the events leading up to Howard and Bernadette’s wedding, beginning with Bernadette’s decision to move their wedding up to before the launch and have a small service with their friends. They plan on going to city hall to get married, and Amy throws a very Sheldon-like hissy fit as she’s denied her dream of walking down the aisle in her maid of honor dress with 100 eyes on her while a string quartet plays “The Way You Look Tonight.” Amy ends up wearing her dress to city hall anyway, where Sheldon spills the beans that Leonard proposed to Penny mid-coitus. The group gets its yuks after hearing about Leonard’s heart-crushing disappointment, but Leonard still holds Penny’s refusal of the proposal against her, which is ridiculous considering they’ve only just started dating again. This is a classic example of Leonard moving faster than Penny and lashing out when she’s not ready to make the same level of commitment, and it’s exacerbated by Howard and Bernadette’s impending nuptials. Penny and Leonard make a good couple in theory, but not so much in practice, and it doesn’t seem like she is ever as attached to him as he is to her. I don’t know if that will ever change for the two of them, but maybe the writers will find a way next season. When their City Hall plans are foiled, Raj suggests Bernadette and Raj get married when the Google satellite is above Pasadena, so that they can have their wedding photographed from space. They decide to have the ceremony on the roof of the apartment, and it’s an intimate affair where the cast gets to say what they mean to each other. Or in Sheldon’s case, what he means to himself. It’s a cute ceremony, and a touching end to Howard’s storyline, even though he’s started developing this weird habit of calling his wife “Ma.” Simon Helberg is definitely the male MVP this season, and Howard has made some really impressive growth this season, especially in the latter half. He’s evolved past the joke character he was at the start of the series and has become the most fully developed member of the male cast. Thanks to their friends and the power invested in them by the Internet, Bernadette and Howard are named man and wife, just in time for him to be launched into orbit and certain death. Wouldn’t it have been a crazy twist if Howard’s shuttle exploded? It would have been horrible, but a totally insane cliffhanger. The alternative is a lot sweeter, with the gang pairing up in Sheldon and Leonard’s living room to watch the launch. “I love that man,” Bernadette says as she grabs Raj’s hand. “Me too,” he replies, because he’s like totally gay. Penny and Leonard forget their drama and hold hands, and then most importantly, Sheldon is so overcome with emotion that he grabs Amy’s hand. It’s a perfect first step if Sheldon is going to become more physical to Amy, appropriately juvenile for his boyish view of romance. The image of the six friends holding on to each other tightly as they watch the seventh achieve his life’s dream is a powerful way to end the season, and it’s a good omen for the future of this series. I’m excited to see the new frontier Big Bang Theory explores in the year to come. Jokes about the Green Lantern movie were a go-to this season. I wonder how many times Dark Knight Rises will be mentioned next year? I like the satellite dishes on the rooftop. I love that Howard’s gift to all his groomsmen is Fantastic Four Annual #3, the issue where Mr. Fantastic and Invisible Woman get married. I would totally be in someone’s wedding to get that as a present.